The present study in the ceramic industry and iron industry has given rise to concerns regarding the workers' health perspective. Of the two types of industries, the technologically advanced ceramic industry was observed to be a tougher workplace due to the direct handling of hot output products in the workplace and heavy manual material handling (MMH). Iron foundries also require handling of potentially injurious raw materials to furnace work and rolling; however, workplace heat is the prime concern. Therefore, the present study was conducted in the ceramic industry and iron foundry to recognize the workplace environment and heat load between these hot workplace industries, and to comparatively examine the characteristics of self-reported physiological responses and heat-health perception among workers. The study was conducted in seven ceramic industries manufacturing wall and floor tiles as well as sanitary wares in the Western part of India. The study was conducted from March 2013 to March 2014. The worker's work primarily involved heavy and frequent MMH, holding, lifting, lowering, and manual transportation of hot ceramic finalized products. Similarly, workers in five iron foundries of the region were studied. This work involved the manufacture of iron bars, mould sheets, etc. The workers primarily handled scrap iron raw materials, MMH around the furnace, stacking, polishing and molding of iron bar, tubes, rods, and sheets. The Thermal Microclimate HD32.1 (Delta Ohm, Padova, Italy), a portable instrument, was used in the study to analyze the thermal microclimate of the workplace. Microclimate is explained as environmental parameters influencing heat exchange between a worker and his/her workplace surrounding. These microenvironment climatic factors, along with the nature of work performed aid in the generation of a series of biological responses associated with thermal discomfort/comfort. A total of 574 workers were studied from both the industries (ceramics n = 321; iron foundry n = 253). The participants were informed about the purpose of the study and the measurement procedures. A detailed written informed consent to participate in the study was taken from all the participants. The protocol of the study was approved by the institutional ethics committee. For heat health assessment among workers, self-reported data were recorded using a heat health perception questionnaire. Perception responses of the workers regarding daily water intake, frequency of urination, sweating, thirst, dehydrated mouth, muscle pain/spasm, and elevated body temperature were recorded. Likert attitude scale was used, which indicates the responses to "secondary statement" by a single digit score on 5-point; low score is a positive indicator of the perception of absence of a problem. A score above 3 was considered as an indication of high strain. The checklist entries were responded to by a single digit score on a Likert scale with a common 5-point scale ranging from strong disagreement (score of 1) to strong agreement (score of 5) where a low score indicated the perception of absence of a problem. Analysis of data was performed in the Statistical Package for the Social Sciences (SPSS) for Windows Version 16.0 (Chicago, IL, USA). Data from the ceramic and iron foundry workers were summarized in descriptive statistics. The normality distribution of data was checked by Shaipro-Wilk test. The relationship of the stressors, pain health symptoms, and psychosocial stressors and stress symptoms to musculoskeletal disorders (MSDs) and health complaints was examined by the Chi-square test. Associations between physical health complaints and independent variables were examined by the Chi-square test and the results were observed at a significance level set at P < 0.05. The area heat stress monitor was placed at the workers' workplaces. At the ceramic plant, the instrument was placed at the workplace, parallel to the center of the kiln. In the iron foundry, the instrument was placed at around 4 m from the blast furnace. The mean ambient temperature was 43.4 ± 3.7°C in iron foundries and 39.9 ± 3.3°C in ceramic industries, whereas the relative humidity was as low as 22.5% in iron foundries and 17.4% in ceramic industries. 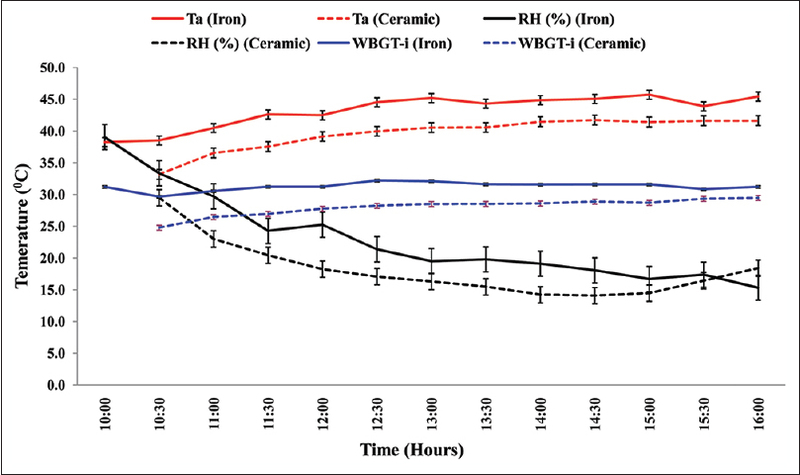 The wet-bulb globe temperature (WBGT) index was ~31.5°C in iron foundries and ~28°C in ceramic industries [Figure 1]. These data were collected from 10:00 AM to 4:00 PM on all working days. [Table 1] shows the general characteristics of the workers studied. The height and weight among the workers in both the industries was similar. More than 50% of the workers in the ceramic industry worked for less than 3 years. The participation of the iron workers was found slightly better with ~15% having worked continuously for more than 10 years. Daily water intake was higher among the iron workers than their counterparts in the ceramic industry (P < 0.001). The workers' perceptions toward climate and the rate of perceived exertion are mentioned in [Table 2]. The workers' perceptions toward the work climate were presented in three categories: Comfort, warm, and hot; the scale for climate perception had a range of 1-9, i.e., "cold" to "hot." The perception of a hot workplace was significantly higher among the iron workers (P < 0.05) followed by the feeling of warm workplace, indicating higher discomfort due to an extreme climatic condition at workplace. Corroborating the perception of workplace climate, RPE scale revealed that the feeling of extremely hard work was higher among the iron workers than the ceramic workers. 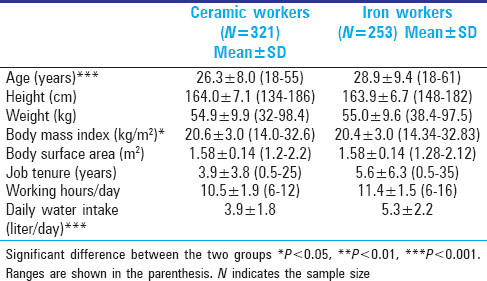 The occurrence of "hard" condition in the ceramic workers was significantly higher than the iron workers (P < 0.001). The perceptions toward physiological thermal responses of workers were recorded and are mentioned in [Table 3]. 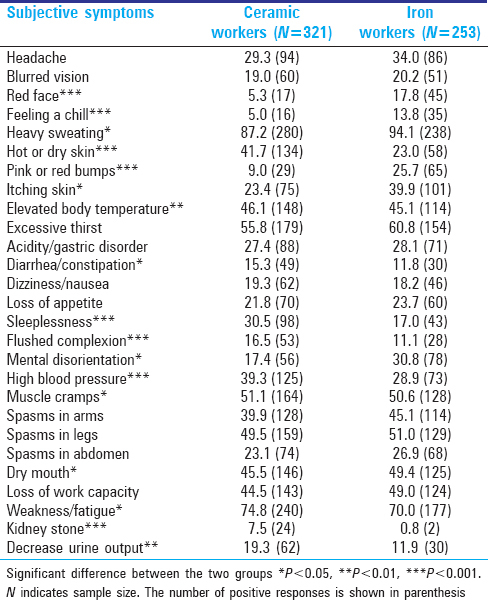 The prevalence of self-reported hot or dry skin, sleeplessness, flushed complexion, high blood pressure, and kidney stone were found significantly in ceramic workers than in iron workers (P < 0.001). Other skin-related problems such as red face, feeling a chill, and pink or red bumps, and (P < 0.001) itching in the skin (P < 0.05) were more prominent among iron workers. Elevated body temperature and decreased urine output were found significant subjective symptoms among ceramic workers (P < 0.01). Concerning the other subjective symptoms, there was no significant difference between ceramic and iron foundry workers. 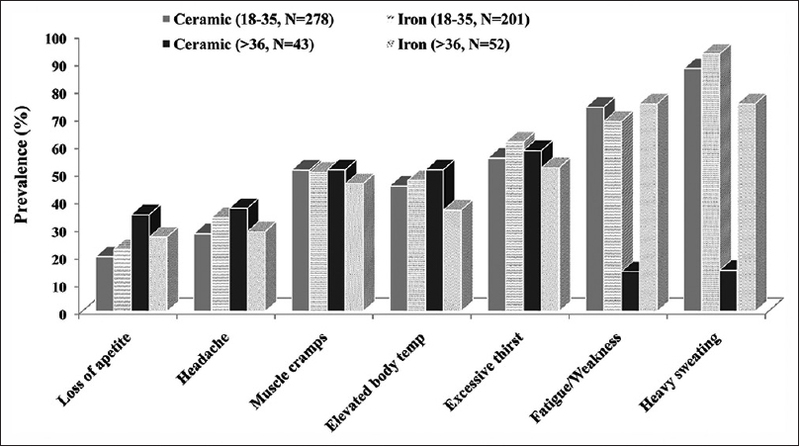 [Figure 2] shows age-specific analysis for the prevalence of subjective symptoms among the ceramic and iron foundry workers. It was observed that loss of appetite was higher in older workers than younger workers in both the industries. Muscle cramps were almost similar among similar age groups in both the industries. However, older workers in iron foundries reported a feeling of more fatigue than their younger counterparts. Heavy sweating was reported in iron industries in both the age groups. Further, younger workers reported more sweating than their older counterparts in both the industries. The continuous exposure to workplace heat poses potential health risk accompanied by a reduction in productivity. , Heavy MMH and direct contact with hot items at work add to the risks. Ceramic and iron foundries generate extreme heat during the production process, demanding substantial manual labor and continuous involvement of the workers. In addition, since the work process in these industries, particularly the ceramic industry is mechanical, the workers have to maintain their pace through the entire process to avoid any productivity lapse. With prevailing environmental heat load in the Western part of India, the work in these industries get worse and the perceptions of workers with regard to their working health provide an indication of their vulnerability. Therefore, the present study focused on elucidating the environmental scenario in these industries and compared the workers' perceptions toward climate and health symptoms between ceramic and iron foundry workers. With regard to the environmental heat load in both the industries, the ambient temperature starts creeping with the progressing hours of the day. The temperature in both the industries remained in the highest range during the post-lunch period (1:00-4:00 PM). It was noted that the heat index was more in iron foundries (114°F) than in ceramic industries (102°F), categorizing the environment condition as category III (very hot) for the iron industry and category II (hot) for the ceramic industry. Working in such arduous environments may be cause heat cramp, exhaustion, and even stoke with prolonged exposure. In the present study, it was observed that the average work tenure of workers was more in the iron industry, which might be due to the ceramic industry's demand of working with high MMH, precision, and in tandem with the mechanical pace with concentration. The working hours/day in the iron industry was more than that of the ceramic industry. This was even more than a similar type of work in other countries. Further, there is a perceived realization that the workplace in the iron industry may be an extremely difficult workplace, , maintaining that a safer workplace is a common perception among the workers as well as the management. The presence of drinking water facilities was observed to be more readily available in the workplace of the iron industry than in the ceramic industry. Also, the continuous maintenance of pace with the moving conveyor belt was not present in the iron foundries, which might be one of the reasons for higher water intake among the workers [Table 1]. This was also reflected in the symptoms reported in [Table 3] (excessive thirst, kidney stone, and decreased urine output). As seen in [Table 3], weakness, fatigue, and muscle cramps were reported to be higher among the ceramic industry workers. This was because of the fact that the production process in ceramic product manufacturing involves a lot of MMH, forward bent posture for a prolonged time, frequent lifting, and repetitive movements of the upper extremities in carriage of heavy loads. Several studies have reported musculoskeletal discomfort and pain while exerting similar efforts at work. ,, On the contrary, although the workplace in the iron industry is hotter than the ceramic industry, the workflow is primarily mechanical, except for the use of the upper extremities in manipulating the raw material into the furnace, demolding of iron bars, polishing, and guiding the iron bars into rolling mills over mechanical rollers. The present study result also showed that 45.1% of iron workers reported spasms in the upper extremities. It was observed that skin-related problems such as pink or red bumps and itching skin were reported to be higher among iron foundry workers than ceramic industry workers. Accidental firing of molten iron droplets during blast furnace operation and sprinkling of iron dust during the polishing of iron bars are the prime factors behind such a high prevalence of skin problems. Earlier studies also reported a high prevalence of such injuries among iron industry workers. , Though other responses such as headache, blurred vision, and loss of appetite did not significantly differ between the workers from these two occupations, these had a higher prevalence in iron foundry workers. Age-specific analysis in our study revealed that 86.6% and 79.4% of the workers in the ceramic and iron industries, respectively, belonged to the age group of 18-35 years, which implicated that there was a young workforce in these industries. Studies on heat tolerance reported that middle-aged workers were more susceptible to heat-related disorders at work. Our study results report young and middle-aged workers as more vulnerable to heat stress than the other workers. Some other studies report that young workers due to their inexperience, less safety training, less recognition of risk of heat exposure, and supervisor pressure, work beyond their individual tolerance to be more susceptible to heat-related injuries. , From the present study results, it is revealed that although the young workers reported more sweating, feeling of fatigue, and muscle cramps than the older workers, they ignore the heat-related symptoms more and continue their work, giving more importance to the source of livelihood. These symptoms at the workplace are vulnerable factors toward lower productivity as well as cause of accidents. ,, Working in a hot workplace environment with the above perception of the workers may lead to dehydration and central fatigue. Also, the core body temperature may rise, resulting in the body's attempt to regulate its temperature through increased blood circulation and profuse perspiration, along with the loss of essential electrolytes, less blood to active muscles, the brain, and other internal organs, leading to a reduction in muscular strength and the onset of fatigue. Further, as reported by the workers long hours of work followed by sleeplessness is a prime cause of less attentiveness, weakness, etc., leading to various errors (omission, commission, sequence, and timing) at work. The strength of the present study was obseving the perceived responses of workers in a substantial number of units of both the industries in the region. This assisted in the recording of a generalizable trend of working health perception of workers, indicating the vulnerability in these professions. However, the limitation of the study was not being able to elucidate the association of various responses of prevailing diseases/disorders with their work and/or working environment, e.g., gastric disorders, kidney stones, and high blood pressure, which was beyond the scope of the study. In conclusion, the western part of India experiences high environmental heat load. Under such hot environmental conditions, work in the ceramic industry as well as the iron foundry is arduous in nature. Considering the heat generated, the working environment in the iron foundry is hotter than in the ceramic industry. However, material handling, direct contact with hot surfaces, and continuous maintenance of with mechanical workflow make the work more difficult in the ceramic industry. This might have been the reason why occupational career in the ceramic industry was observed to be shorter than in the iron industry. Manual work and heavy load handling in an extremely hot working environment are affecting workers' physiological well-being as well as psychological well-being. We thank the Directorate of Industrial Safety and Health (DISH), Government of Gujarat, India for financial assistance to conduct the study. The authors are indebted to Dr. Kirti Pandit for recruitment of the participants, and Mrs. Bina G Shah and Mr. DS Kshirsagar for assistance for data collection. Brake DJ, Bates GP. Limiting metabolic rate (Thermal work limit) as an index of thermal stress. Appl Occup Environ Hyg 2002;17:176-86. Bridger RS. Introduction to Ergonomics. 2 nd ed. London: Taylor and Francis; 2003. p. 33. Nag PK, Nag A. Vulnerability to Heat Stress: Scenario in Western India. National Institute of Occupational Health: World Health Organization (Ahmedabad); 2009. p. 49-50. Atha WF. Heat-related illness. Emerg Med Clin North Am 2013;31:1097-108. Dash SK, Kjellstrom T. Workplace heat stress in the context of rising temperature in India. Curr Sci 2011;101:496-502. Nag PK, Nag A, Shekhar P, Shah P. Perceived heat stress and strain of workers. Asian Pacific News Letter on Occupational Health and Safety 2011;10:18-20. Yoon JH, Ahn YS. Cause-specific mortality due to malignant and Non-malignant disease in Korean foundry workers. PLoS One 2013;9:e88264. Xiang J, Bi P, Pisaniello D, Hansen A, Sullivan T. Association between high temperature and work-related injuries in Adelaide, South Australia, 2001-2010. Occup Environ Med 2014;71:246-52. Nag PK, Dutta P, Nag A. Critical body temperature profile as indicator of heat stress vulnerability. Ind Health 2013;51:113-22. Solidaki E, Chatzi L, Bitsios P, Markatzi I, Plana E, Castro F, et al. Work-related and psychological determinants of multisite musculoskeletal pain. Scand J Work Environ Health 2010;36:54-61. Cohen AL, Gjessing CC, Fine LJ, Bernard BP, McGlothlin JD. Elements of ergonomics program-A primer based on workplace evaluation of musculo-skeletal disorders. DHHS (NIOSH) Publication No. 97-117. 1997. p. 87-8. Inaba R, Mirbod SM. Comparison of subjective symptoms and hot prevention measures in summer between traffic control workers and construction workers in Japan. Ind Health 2007;45:91-9. National Oceanic and Atmospheric Administration (NOAA). Heat Index Chart. Texas: National Oceanic and Atmospheric Administration. Available from: http://www.srh.noaa.gov/srh/jetstream/global/hi.htm. [Last accessed on 2015 Feb 20]. Melzer AC, Iguti AM. Working conditions and musculoskeletal pain among Brazilian pottery workers. Cad Saude Publica 2010;26:492-502. Palda VA. Is foundry work a risk for cardiovascular disease? A systematic review. Occup Med (Lond) 2003;53:179-90. Palmer KT, Smedley J. Work relatedness of chronic neck pain with physical findings-A systematic review. Scand J Work Environ Health 2007;33:165-91. Punnett L, Gold J, Katz JN, Gore R, Wegman D. Ergonomic stressors and upper extremity musculoskeletal disorders in automobile manufacturing: A one year follow up study. Occup Environ Med 2004;61:668-74. Orlando AR, King PM. Relationship of demographic variables on perception of fatigue and discomfort following prolonged standing under various flooring conditions. J Occup Rehabil 2004;14:63-76. Manjunatha R, Kiran D, Thankappan KR. Sickness absenteeism, morbidity and workplace injuries among iron and steel workers-A cross sectional study from Karnataka, Southern India. Australas Med J 2011;4:144-7. Pandolf KB. Aging and heat tolerance at rest or during work. Exp Aging Res 1991;17:189-204. Centers for Disease Control and Prevention (CDC). Occupational injuries and deaths among younger workers-United States, 1998-2007. MMWR Morb Mortal Wkly Rep 2010;59:449-55. Nag PK, Bandyopadhyay P, Ashtekar SP, Kothari D, Desai H, Nag A. Human work capacity under combined stress of work and heat. J Hum Ergol (Tokyo) 1996;25:105-13. Hanna EG, Kjellstrom T, Bennett C, Dear K. Climate change and rising heat: Population health implications for working people in Australia. Asia Pac J Public Health 2011;23(Suppl):14S-26. Bates GP, Schneider J. Hydration status and physiological workload of UAE construction workers: A prospective longitudinal observation study. J Occup Med Toxicol 2008;3:1-10.